Three friends and I had truffle-making day. We made a boatload of wonderful truffles with liqueurs on the inside and randomly (I mean, measured and carefully...) mixed dark chocolates on the outside. 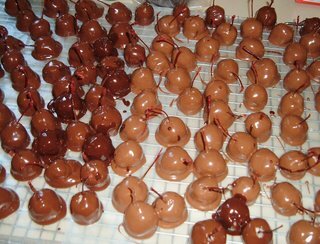 Besides the truffles, we also made lots of caramels and chocolate-covered cherries. They are a little soft and spread out from using coconut oil instead of Crisco in the outer mix, but they are better-tasting and healthier this way (not that maraschino cherries will ever be in any way healthy). All in all, we had a great time, and this will hopefully become a yearly event. Candy Making Days - Gotta love 'em! Join in and write your own page! It's easy to do. How? Simply click here to return to Your Candy & Dessert Photos.